Purpose: Use this document as a reference for processing a 3rd Party payment for multiple students in ctcLink. Enter or select a Business Unit. Enter or select a Cashier’s Office. Enter or search for the Third Party in the External Org ID field. 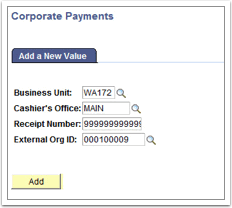 Ref Nbr is an optional field to enter details about the check. Enter the payment type into the Target field (e.g. CHECK). 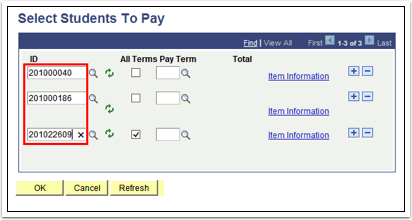 Enter the Term to allocate the payment to charges for a specific term (optional). Enter the Tender to indicate payment method (e.g. CHECK). ctcLink prompts for further optional check information. The Amount populates from the prior entry. Click the Select Students to Pay link. ctcLink navigates to the Check Information page. 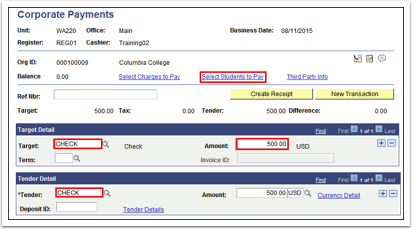 Enter details about the check such as check number if required by institution policy. Click Cancel if this is not required. Enter or search for the ID of the student to pay. Enter the Term if required or check the All Terms box. Click the Item Information link to add details about the payment for this student. Continue to add students by clicking the (+) and repeating the steps above. Click OK when all students are added. Click the Create Receipt button. The Create Receipt button becomes the Print Receipt button. Click the Print Receipt button to print a receipt to print a paper receipt if required.Click New Transaction to enter a new third party payment.